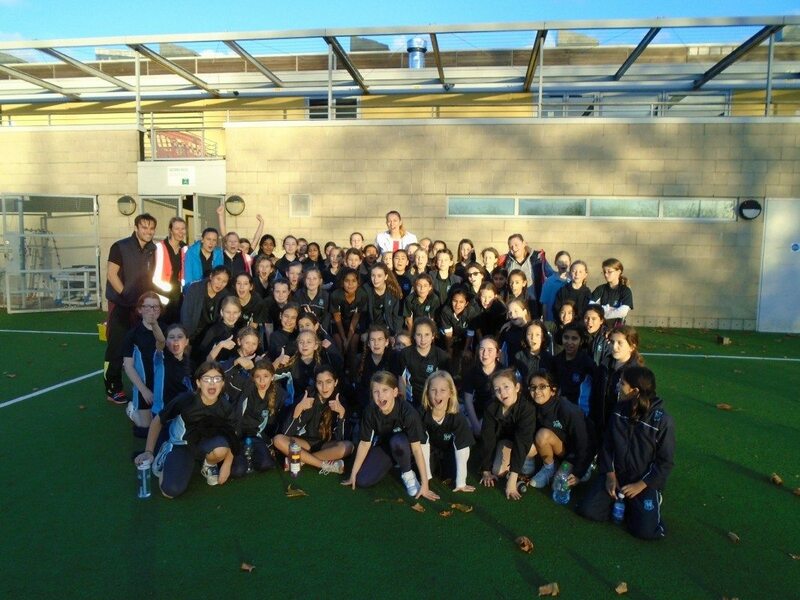 On Friday 14th November North Bridge House was visited by International England Netball Player, Lindsay Keable. All girls in Years 5 and 6 listened to her speak about the importance of dedication, motivation, team work and discipline in order to achieve their goals. The girls learnt that one of Lindsays’ goals was to wear the ‘red dress’ of the England Netball uniform. Leela in Year 5 was even lucky enough to try on Lindsays’ red dress. The Year 6 girls and the Year 5 A & B Netball teams then had a practice session run by Lindsay. The girls learnt more about defence and how to protect their space whilst having a few laughs along the way. This was an amazing experience for all of the girls and I know Miss Teare will agree that all the girls had fun, learnt a lot and are even more motivated with their sport now. To read more about the event, please click here to see the article that appeared in the Ham and High, or see below for some fantastic accounts from our own pupils. Tamara (Year 5): On Friday 14 November 2014, Year 5 and 6 girls met a famous England Netball player called Lindsay Keable. She taught us how to improve our netball skills by watching what we could do and then gave us tips on dodging, defending and shooting to polish our technique. All of the girls had a fantastic time with Lindsay playing netball and getting to know her. Thank you Miss West, Ms Teare and of course Lindsay. Ella (Year 6): On Friday 14th November, professional England netball player Lindsay Keable came to North Bridge House Prep School. The Year 5 and 6 girls were all told to come down to the gym to meet Lindsay and hear the inspiring talk she gave. Everyone listened very carefully and the talk ended with a round of some very interesting questions. Our Head Girl, Alara Tindall, gave a fantastic speech, and then we all got on the coach and went to Talacre for a professional netball coaching session with Lindsay herself! We played lots of fun games to help us with our netball skills. We also played a quick game of netball then headed back to school, all chatting and talking about the very fun day we had just had. Then the day got even better when we all received a signed photograph of Lindsay Keable. I would like to thank Miss Teare and Miss West for organising the event. NBH Year 5 and 6 girls and I would like to say an enormous thank you to you, Lindsay, for visiting us today. Lindsay, not only did you join us for your netball practice but you also talked about your own sports life and valuable experiences. Lindsay, you made us realise, once again, apart from the fact that you are the best netballer we have ever seen, that being a good sports-person involves many character traits such as determination, hard-work, patience, team-effort and a kind personality, which we can see you have. I must say at NBH, we girls value netball a lot, even though we might not be the best catchers, shooters or tall in height! It has been a very busy term this year for Year 5 and especially Year 6 girls who are getting ready for their next schools’ entrance exams. Your presence helped us have a nice break from our intensive studies and realise that when we are old, netball could have a really big impact on our lives – who knows, you might see some of us knocking around in the England netball team. One last thing, and I think everyone will agree, you have inspired us completely and your nickname ‘Lindsay Long Legs’ has proven correct. You are such an inspirational person and can I thank you once again for the time you took to come here. We promise to keep you updated about our future netball achievements and I think Lindsay deserves a round of applause… Thank you.